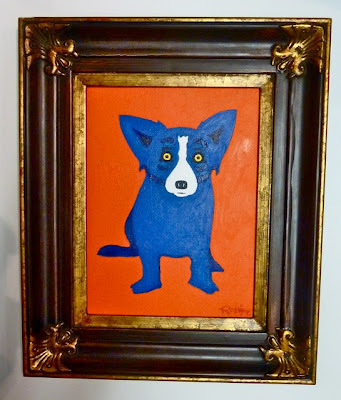 “We all know that precious things come in small boxes,” says George Rodrigue. “Art and scale have a definite relationship. Words that describe the size of art tend to explain it in a unique way. 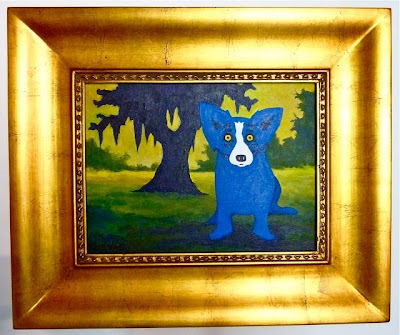 Small compositions are unusual for George Rodrigue, and it’s been more than a decade since he approached canvases of the size of his recent works. In fact, most of his paintings from 2010 are large scale, some twelve feet across, as he celebrated the expansive walls of his new French Quarter Gallery. It surprised me when George began work on these petite canvases just after the first of the year. Not only is the size rare, but also is a complete series of work created in New Orleans. For many years now, he reserves long stretches at his easel for the privacy and quiet of his studio in Carmel, California. Small paintings with landscapes or multiple dogs are especially rare. These require a tight, controlled approach, along with the use of small brushes and a mahl stick, something George seldom uses since his Cajun paintings of the 1970s and 1980s. Although small in size, these paintings are not miniatures. However, George painted true miniatures as well, some as small as two inches squared, for a brief period in the early 1970s (as detailed in the post “Miniatures: Manuscripts, Landscapes, Blue Dogs, and Blogs”). George’s early miniatures feature his oak tree, as do several of the small paintings today. He still enjoys many of the same subjects of forty years ago. Like the Blue Dog, he made Oak Trees, Cajuns, and even Jolie Blonde and Evangeline, his own, repeating these subjects in various forms over the course of his entire career. As with his early oaks, he still cuts the tree off at the top, creating interesting shapes underneath and between the branches. As with his Cajun people, he locks the dog into the landscape, as though pasted onto Louisiana, trapped by a strong design, and unable to move both symbolically and literally. 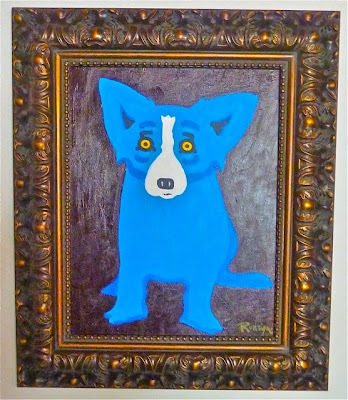 However, unlike his early paintings, today’s Rodrigue landscapes include solid blocks of bold colors, an echo of his art school years and the hard edges and electric hues of Pop Art. This is especially evident in his simplest designs. “Small artwork is ‘precious, unique, intimate’ and at times (as with large scale) breathtaking, all words that came to mind the first time I saw a real Faberge egg. I approach these small canvases intending to create something precious, something well thought-out and without room for mistakes, as though each one is a jewel.” – G.R. 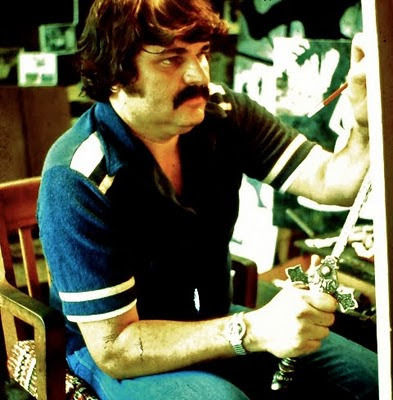 As always, George paints in spurts, sometimes going weeks without picking up his brush, working instead at his computer or sketchbook and, especially lately, on projects for the George Rodrigue Foundation of the Arts. Recently, however, he spends twelve to fifteen hours a day at his easel, no doubt motivated by these small, distinctive works. 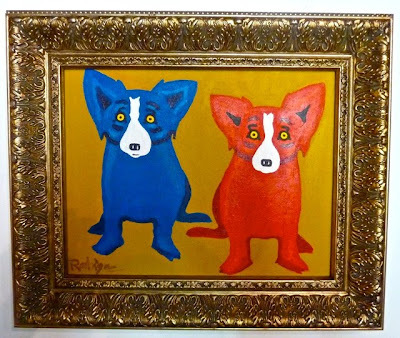 For more information on the small paintings of 2011, contact Rodrigue Studio. I had to go back and read your previous post about the move into the new gallery~~we have not been back to NOLA since Katrina. I am delighted that the lovely brick building is a permanent gallery for Blue Dog (and your hubby too) as it was so pretty at night. 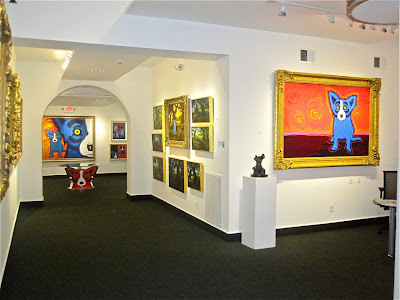 We would often walk past the old gallery across the street and look in at the many delightful incarnations of the Blue Dog and I have fond memories of balmy evening walks and much window shopping. The small size is a something I enjoy in my own art; I find it to speak as much as large pieces and often to be more intimate. Hi Anne - Many thanks for your comments. I enjoyed sharing them with George this morning as he worked at his easel. We hope that you make it soon to New Orleans --- a city that is not only back, but in some ways better, as we've been reminded in the most dramatic way of its unique qualities. And I do believe that since Katrina, we've brought 'southern hospitality' to new heights, because everyone is extremely happy to see our tourists once again. Wendy, I remember seeing some magnificent paintings of oak trees when George was first starting. The frames on some were bigger than the paintings. I am not much of an art appreciator but George's work has always stirred deep emotions in my soul. Maybe I am biased - you know how we Rodrigue's can be. My best to George and you. Thank you, Mark. Yes, that's true. In the early years especially, George 'painted to the frames,' a phrase he coined. For more on this, see the post at this link: http://www.wendyrodrigue.com/2010/01/painting-to-frame.html (you may have to paste it into your brower). I love his paintings of oaks as well. In fact, just this morning I posted the story of George's efforts to save a 250-year old oak tree destined for destruction next month in Youngsville. Wendy, I'm not sure this is the right place to ask, but how much is a print of Aioli Dinner (I think Dinner) where all the men in New Iberia are sitting around a table? If this isn't the right place, could you direct me to the place to ask. Hi Nunie - Please email your request (with your email address) to info@georgerodrigue.com , and someone will get back with you asap! 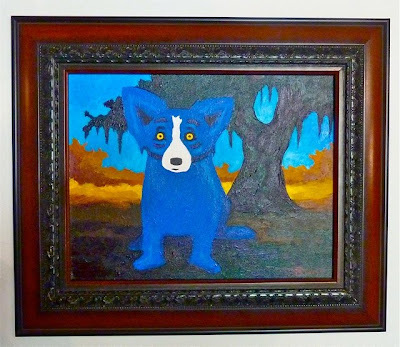 I just wanted to say that George Rodrigue's painting are truly inspiring. 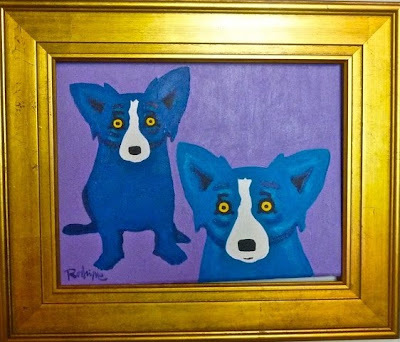 I never thought I had any artistic ability, but the Blue Dog painting inspired me.I have been going through a really rough patch and the artwork of Rodrigue has kept me going. I have been reading all of his books and am planning a special trip to Carmel tomorrow just so I can visit his gallery.